The aim was to study the nutritional of outdoor vegetables grown in Finland and the effect of calcium fertilization and prestorage calcium and heat treatments on quality and storability of vegetables. The investigation was carried out during 1999-2001 in commercial fields in southern Finland, in the mainland and in the Åland Islands, and in the experimental field of Viikki, University of Helsinki. Experimental crops were white cabbage, Savoy cabbage, Brussels sprouts, cauliflower, broccoli, kale, Chinese cabbage, leaf lettuce, iceberg lettuce, squash, cucumber, leek, onion, red beetroot, rutabaga, carrot, celeriac and potato. Crop samples were collected 1-3 times during the growing season and dry matter and nutrient composition (C, N, P, K, Mg, Ca, B, Cu, Zn, Mn, Fe) were determined. 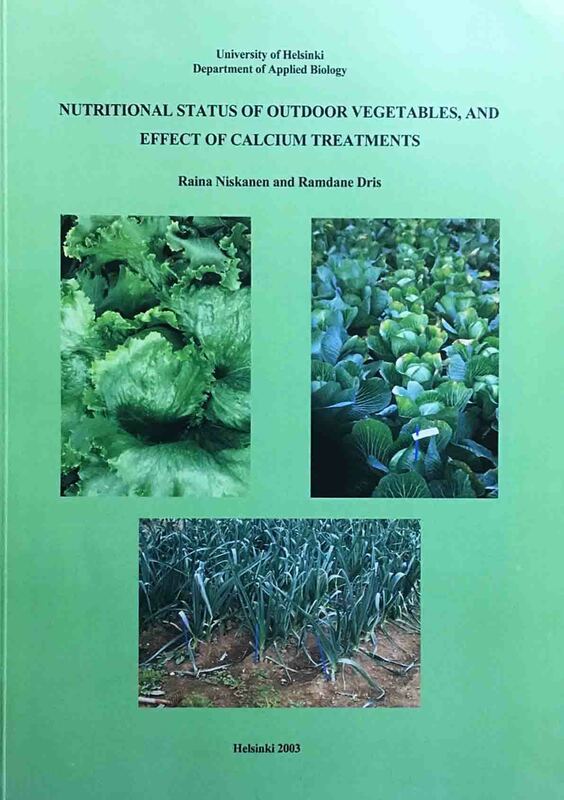 The effect of calcium fertilization on nutrition and storability was studied in commercial farms on white cabbage, Savoy cabbage, Chinese cabbage, leek and onion. In the experimental field of Viikki, the effect of calcium given by fertilization or foliar application was studied on Chinese cabbage, iceberg lettuce, leek, carrot, rutabaga and celeriac. Storage experiments were carried out on white cabbage, Savoy cabbage, Chinese cabbage, squash, cucumber, leek, onion, red beetroot, rutabaga, carrot, and celeriac. During the storage, the incidence of diseases and disorders was observed and the metabolic activity in storedorgans was followed by determining the juice pH, titratable acidity and soluble solids concentration. The effect of prestorage calcium and heat treatments on storability was studied on rutabaga, carrot, celeriac and leek. In vegetable crops there were changes in nutrient concentrations during the growing season and differences between plant parts in dry matter and macro- and micronutrient concentrations. Plant parts with low Ca concentration were inner leaves vegetables, fruits, storage roots and tubers. Ranges of macronutrient contents kg/t FW in yield of different crops were N 1-10, P 0.2-1.2, K 1-10, Mg 0.1-0.6, Ca 0.03-3.6. During the storage of vegetables the diseases and disorders found were watery soft rot in white cabbage, cucumber and celeriac; bacterial soft rot in white cababge, Chinese cabbage and leek; grey mould rot in white cabbage, carrot and celeriac; mould in rutabaga; black mould rot in onion; blue mould rot in squash; dark leaf spot in white cabbage and Chinese cabbage; powdery mildew in white cabbage; downy mildew, tipburn and withering of leaves in Chinese cabbage; yellowing in Chinese cabbage and cucumber; chilling injury, Choaneophora, Cladosporium and Phytophtora rots and Didymella black rot in squash; cottony leak and Pythium rot in squash and cucumber; skin-splitting and purple blotch in onion; white tip in leek; white rot in leek and onion; scab in red beetroot and carrot sprouting in red beetroot; dry rot, brown heart and internal browning in rutabaga and celeriac; shrivelling, skin deformation and cavity spot in carrot and rust in celeriac. There was a trend that Ca content in leaves was increased by CaSo4 fertilization or foliar CaCl2sparying in white cabbage, Chinese cabbage and iceberg lettuce. CaSo4 fertilization reduced bacterial soft rot in white cabbage; tipburn and withering leaves in Chinese cabbage; skin-splitting, white rot and black mould rot in onion; mould in rutabaga; scab in carrot; watery soft rot, dry rot and internal browning in celeriac. Ca fertilization reduced white tip, Cladosporium rot and bacterial soft rot in leek; dry rot and mould in rutabaga and grey mould rot in carrot. CaCl2 spraying treatments reduced dark leaf spot in Chinese cabbage and prestorage CaCl2 treatments watery soft rot, rust and dry rot in celeriac. Prestoragr heat treatments reduced grey mould rot and scab in carrot; mould in rutabaga; dry rot in rutabaga and celeriac and internal browning in celeriac. During the storage of white cabbage, Savoy cabbage, Chinese cabbage, leek, onion and celeriac there were changes in the juice pH, titratable acidity and soluble solids concentration. In most cases Ca fertilization decreased the juice pH and titrable acidity of white cabbage, leek and Chinese cabbage. CaSo4 fertilization increased the titrable acidity of white cabbage and celeriac and soluble solids concentration of white cabbage, leek and celeriac and decreased the soluble solids concentration of white cabbage, Savoy cabbage and onion. CaCl2 spraying treatments decreased the juice pH and soluble solids concentration of Chinese cabbage, and prestorage CaCl2 dipping increased the firmness of carrot. Research report of a project on outdoor vegetables including white cabbage, Savoy cabbage, broccoli, cauliflower, Chinese cabbage, lettuce, cucumber, squash, onion, leek, red beetroot, rutabaga, carrot, celeriac and potato. Nutritional status and calcium uptake in outdoor vegetable stands during the growing season and effect on quality and storability was studied.